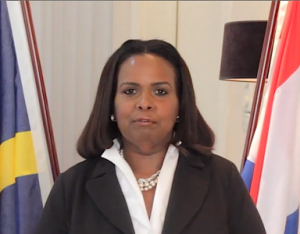 WILLEMSTAD – Now that the Minister Plenipotentiary of Curaçao in The Hague, Marvelyne Wiels has lost the case against the Ombudsman, Alba Martijn, the way is open for the final report to be sent to parliament and to the government of Curaçao. Tomorrow the Ombudsman will present this report to parliament. Wiels will also receive a copy on the same day. Wiels tried to prevent the Ombudsman to make this report public, by filing a lawsuit, but it did not go the way she wanted. Tomorrow the report will also be published on the Ombudsman’s website, which means that it will be available for everyone. Opposition parties PAR, MFK and Independent Member of Parliament, Omayra Leeflang have disapprovingly commented on the situation around Wiels. MFK even requested a public meeting on this issue as soon as possible.